‘Orbital SFX – Massive Presets’ from ModeAudio straps gargantuan tanks of rocket fuel onto the sides of Massive in preparation for takeoff! With its nose pointed squarely at the stars, this collection of 50 handcrafted SFX presets aims to take your music to the stratosphere and far beyond. ModeAudio have vacuum-packed risers, falls, impacts, explosions, bleeps, sub drops, reverses and more into this hyperactive preset pack – load them into your session and listen to them surge, soar and spiral throughout your music! Every element of Massive has been studied, tested and put to dynamic use in these presets, with special attention paid to programming deep modulation routings and networks. Listen to filters snap open and closed at light-speed; oscillator pitches race up to the brink only to fall crashing back down to Earth; cranked effects levels alternately slam and release the pressure. You better stay seated because it’s going to be a bumpy ride! As with all ModeAudio synth presets, all 8 macro controls have been assigned for maximum control and flexibility. Program your external MIDI controllers or dial in some automation in your DAW to have instant access to core aspects of every preset, from filter resonances and cut-offs, distortion amounts, waveshaping and pan modulation to LFO types, envelope durations, wavetable positions and much, much more. 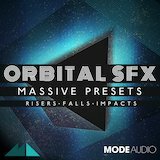 Launch your productions above the clouds with ‘Orbital SFX – Massive Presets’!